In What is Urban History?, Shane Ewen provides an enjoyable, coherent and informative primer on the importance of urban history when it comes to understanding the development and future of cities as well as urbanisation processes. While the book’s brevity occasionally limits detailed interrogation of individual case studies or methods, Jenny McArthur welcomes this interdisciplinary text as a valuable overview of use to both new and experienced researchers in the field. What is Urban History? Shane Ewen. Polity. 2015. Urban research has garnered the attention of many academic disciplines, and can easily become overloaded with a multiplicity of perspectives, theoretical frameworks and vocabularies. Shane Ewen’s What is Urban History? makes a compelling argument for historical inquiry to bring clarity to our understanding of cities. Ewen promotes an interdisciplinary approach that cuts through the confusion and diversity of theories, using urban history to draw together common threads across disciplines and explain urbanisation processes with clarity. While urbanisation is a diverse phenomenon, continuity can be found in each city’s need for resources, people, functioning economic networks and governance. What is Urban History? reasserts the role of urban history, exploiting this continuity to understand urbanisation processes and interactions. At first glance, a book with this title and only 184 pages appears overly ambitious. However, the text covers a vast range of sources without exasperating the reader. The first chapter makes the book’s task clear: the scope is limited to modern cities and deliberately leaves out an explicit treatment of economic history. Rather than a comprehensive and plodding description of the field, the book is structured thematically by the main historiographical debates. Ranging from transnational and environmental histories to governance and the influence of modernity, the text emphasises the relevance of cross-disciplinary approaches to urban history. Focusing on themes that cut across disciplines, the text avoids becoming burdened by excessive detail, and underlines the real value of urban history. Historical inquiry draws common threads, and is useful to bring clarity and coherence to urban research. The early development of urban history is charted as it emerged on both sides of the Atlantic. The ‘Chicago School’, led by sociologists Louis Wirth and Thomas Gieryn from the 1920s, advanced the role of the city as a living laboratory, showing the importance of observation and discovery to the field. Later in the 1960s, the work of British historian H.J. Dyos at the University of Leicester highlighted the importance of scale. The ‘grand processes’ of economic, demographic and technological change and individual, lived experiences in cities are equally important to constructing urban histories. Dyos’s definitive monograph on the development of Camberwell in South London, Victorian Suburb (1961), exemplifies the convergence of various disciplines in urban history. Urban history ‘combined nostalgia for a past which appeared richer than the present with ‘a dream of a city of the future, capable of reconciling community and social control, nature and culture’. The modern metropolis was increasingly depicted as a spectacle that was best experienced by walking the streets […] only then could the paradox of wealth and misery be truly appreciated by the individual. Broadening the geographic scope, transnational urban histories effectively illustrate how urban forms travelled across continents and cultures. As transport and communications technologies, alongside post-colonial legacies, have enabled the reach of institutions and influence across the globe, transnational perspectives provide useful explanations of urban trajectories and the flow of technology and ideas. From the far-flung, such as John Griffiths’s study of British imperial influences in cities in Australia and New Zealand, to Helen Meller’s investigation into more proximate relations between European port cities, transnational perspectives hold increasing value in an interconnected and globalised world. Urban histories outside the Western world and former colonial outposts could have been elaborated further, although brief descriptions of urban development in Brazil, Kenya, Turkey and inland regions of China hint at the breadth of scholarship in these regions. 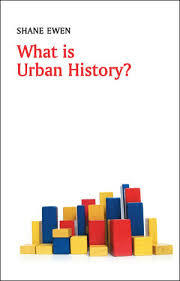 Perhaps unusually for an academic primer, What is Urban History? is enjoyable and captures the dynamism of urban history. Ewen’s insightful consideration of culture and representations, alongside the statistical facts and lived experience of urban histories, captures the intensely human nature of cities. While there are numerous occasions where the need for brevity has been prioritised over more elaborate descriptions of individual case studies or methods, the book is a worthwhile overview for both new and experienced researchers. A strong case is made for urban history’s value and relevance, and Ewen sets a mandate for the continued development of interdisciplinary urban history.